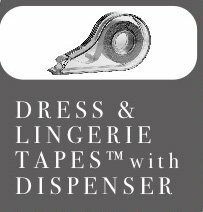 Fashion Fashion #12538 Dress & Lingerie Tape Dispenser. Easy to apply, easy to remove, hypo-allergenic. Double sided adhesive tapes, transparent and non-toxic. Garment and body adhesive tape for holding daring fashions in place. Avoid embarrassing slip ups with this double-sided tape. Additional pieces of tape can be used to secure clothing. 1. Tear off your desired amount of tape, shorter pieces are easier to handle. Trim as desired. 2. Remove paper backing on one side. 4. Remove paper backing from the other side and adhere to clothing.